Conservative author and radio host Rush Limbaugh promoted the latest article by conservative law professor and writer Glenn Reynolds in USA Today on Monday. Glenn Reynolds called on Trump on Monday to breakup the tech monopolies like his predecessor Teddy Roosevelt did back in the early 1900s. Donald Trump must bust Facebook, Amazon, Netflix, Google monopolies like Teddy Roosevelt. RUSH: Glenn Harlan Reynolds, who’s a friend and a law professor at the University of Tennessee, has a column out today in USA Today saying that Trump has got… Forget prison or anything else. If Trump doesn’t get a handle on the monopolies that exist now — Facebook, Google, Netflix, and (What’s the other one?) Amazon, the social media titans — that if this not gotten handle on, we don’t have a prayer because they have monopolized social media, and in the process of monopolizing it and mass media, they are excluding anything and everybody conservative. So Glenn’s piece today is suggesting that Trump needs to do his own version of Teddy Roosevelt and bust ’em up. Teddy Roosevelt busted up the trusts, among them Standard Oil, the Rockefeller family, and J. P. Morgan, who was on the verge (chuckles) of owning the United States financial markets. Do you know back in the late 1800s, early 1900s, when the federal government needed money, they went to J. P. Morgan to borrow it? Before there was a tax code, before there was a tax system, they went to J. P. Morgan to get money. Well, J. P. Morgan was one of the trusts that Teddy Roosevelt busted up. I’ll tell you, Glenn Reynolds makes a pervasive case in this — and even if he hadn’t made it, it’s a scary thing. You know, I don’t like monopolies, and I really hate government intervention, but this social media stuff is getting totally out of hand, especially, folks… There’s now polling data. I forget where a term. I’ll find it just a second. It’s a credible polling unit. Do you know that 42% of the American people believe that the Russians meddled with votes in 2016? This has been one of the most successful hoaxes that has ever been run in politics. This has been one of the most successful disinformation campaigns ever, the fact that the Russians and Trump colluded to steal the election. There isn’t any evidence! In fact, in announcing the latest series of indictments, Rod Rosenstein, the deputy attorney general, made it clear that in none of the indictment that Mueller has announced is there any allegation or evidence that a single vote was tampered with! Yet you read newspaper accounts of this or watch cable news accounts, they don’t even mention that that has been acknowledged and admitted by the government. They continue with the myth that not only did Trump and the Russians collude, but the Russians tampered with vote totals. It did not happen, and yet 42% of the American people believe it largely because of the media — and social media, which is one of the biggest promotional groundswells for that point of view. You talk about misinformation and disinformation? This is profound. There is no evidence that any of this happened! As The Gateway Pundit reported earlier…..
On Tuesday night, after the votes were counted, Democrats took control of the US House of Representatives. Wealthy suburban voters and women are being credited for the win. At least 35 Republican lawmakers lost their seats last Tuesday night. Democrats have a huge advantage over Republicans with their partners in the media complex, Hollywood, and academia. And, unlike 2016, this year Democrats can also can give a huge amount of credit to Tech giants Google, Facebook and Twitter. Suburban voters and women no longer were reading conservative articles on Facebook. Facebook eliminated at least 1.5 billion links to conservative articles since 2017. If you add additional websites like The Gateway Pundit, Infowars, Young Cons, Right Wing News, etc. the number tops 2 billion easy. And it likely made a difference on Tuesday night. 80% of women age 18-49 have Facebook accounts. These are the women who get their news from Facebook. Facebook knows this and eliminated conservative content on their platform so there would be no repeat of 2016. 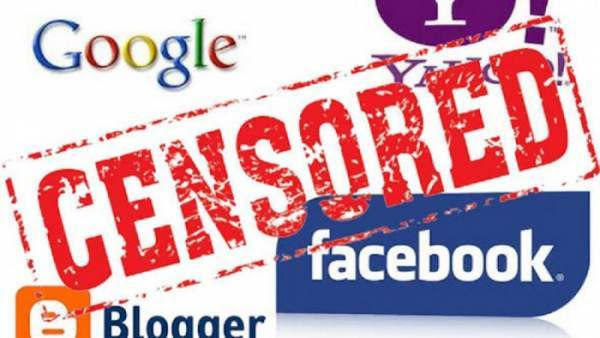 It’s no secret that the Silicon Valley tech giants discriminate against conservatives and conservative content. In August President Trump warned Google about it’s biased practices against conservatives and conservative content in their search feature. Facebook has been shutting down traffic to conservative websites since the 2016 election. The Gateway Pundit recently spoke with two of the top conservative publishers in America. Floyd Brown is a conservative author, speaker and media commentator. In 2008 Floyd launched Western Journal which quickly became one of the top conservative websites in America. By 2016 Floyd’s organization of Western Journal and other conservative websites under his umbrella had more than a billion page views. Since 2016 Floyd’s organization lost 75% of its Facebook traffic. If you combine the total number of page-views lost by just these two conservative online publishers you are looking at a loss of over 1.5 billion page-views from Facebook in one year. These are numbers from just two of the top conservative publishers in America. This does not include the thousands of other conservative publishers across the country who lost all of their traffic coming from Facebook. Here at The Gateway Pundit our Facebook traffic has been effectively eliminated after we were ranked as the 4th most influential conservative publisher in the 2016 election. The fact that Facebook is targeting conservative publishers should not be a surprise to Gateway Pundit readers. We have been reporting on this for several months now. In July we released a study where we looked at several top conservative websites and discovered that the publishers had lost an average of 93% of their Facebook traffic. This is a bloodbath. Facebook has wiped out conservative content to American subscribers. 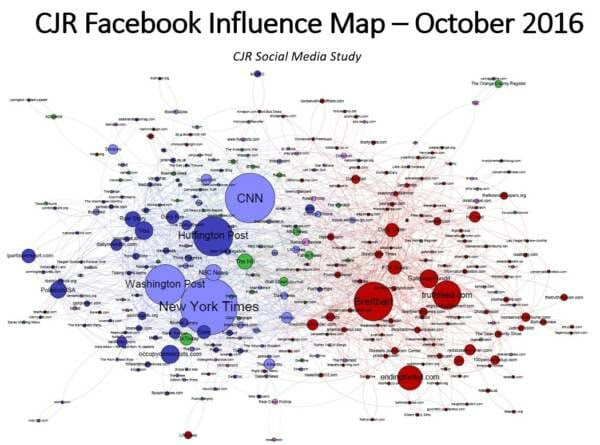 This influence map below by Columbia Journalism Review shows the top influencers during the 2016 election. 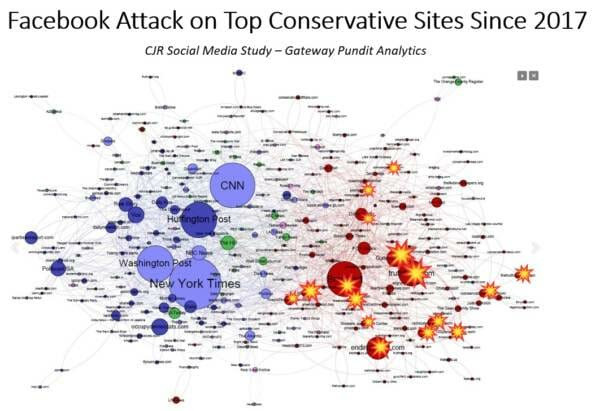 And here is that same map showing the conservative publishers who have been targeted by Facebook since 2017. Facebook has eliminated content from a vast majority of top conservative publishers since 2017. In 2016 suburban voters and women would check their Facebook pages and get conservative news. That is no longer the case. And on Tuesday these voters chose Democrats. Facebook has wiped out conservative publishers. Americans will no longer see articles from conservative websites even if you follow them. Facebook took advertising dollars from all of these businesses and then changed their business plan after the 2016 election. Facebook wants to pretend this was not a political decision. Yet, several top liberal activist groups: Media Matters, Share Blue, CREW and American Bridge, made it a priority in early 2017 to work with the liberal tech giants to undermine President Trump and ensure that liberals gain control of Congress and the presidency in 2020. The tech giants did just that.